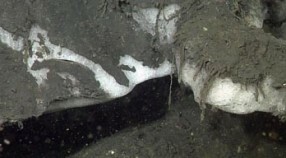 Methane hydrates are ice-like solids that form when methane (natural gas) combines with seawater at the low temperatures and high pressures of the deep sea. 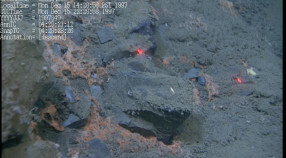 There are also places where methane naturally seeps from the seafloor in bubbles, rising to the surface and into the atmosphere. 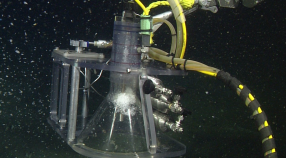 Sept 21, 2012 – In the remote, ice-shrouded Beaufort Sea, methane (the main component in natural gas) has been bubbling out of the seafloor for thousands of years. 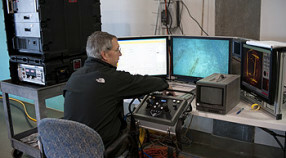 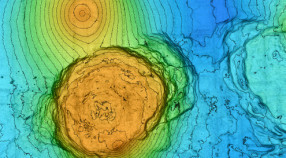 MBARI geologist Charlie Paull and his colleagues at the Geological Survey of Canada are trying to figure out where this gas is coming from, how fast it is bubbling out of the sediments, and how it affects the shape and stability of the seafloor.